Instant Pot Oatmeal: How to cook old fashioned oats perfectly in the pressure cooker. Ideas for toppings, and flavor combinations as well. If you asked my kids what they eat most often, they would tell you hands down oatmeal. Since they were babies, oatmeal has been a staple at our house. I have always loved oatmeal and even have a whole list of recipes made with oats. Oats are a great source of fiber, whole grains and help to regulate blood sugar. When we were gluten-free, dairy-free, and egg-free due to food allergies, oats were our “safe” go whole grain choice. And bottom line, we LOVE oatmeal–whether Overnight Banana Peanut Butter Oatmeal, Hot Cocoa Oatmeal, or Apple Pie Oatmeal. I love to make a large batch of overnight slow cooker oats like Strawberries and Cream Oatmeal or Maple Cinnamon Oatmeal and have breakfast waiting for us. But I have found a new way of making oatmeal that is quickly becoming the preferred method at our house and that is with my Instant Pot. 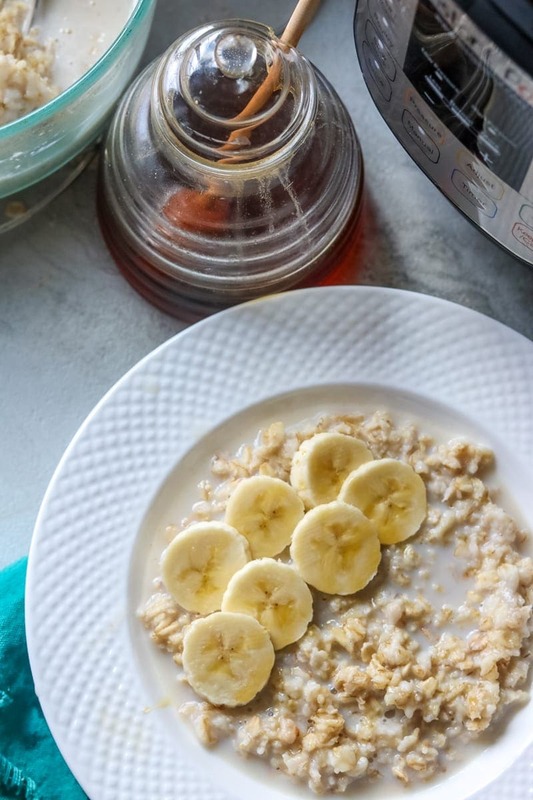 While waking up to a slow cooker full of steel cut oats is dreamy, and grabbing a jar of overnight oatmeal from the refrigerator is a great start to a hot summer morning, I am in love with Instant Pot Oatmeal for a few reasons. In less than 25 minutes from start to finish, I can make a large batch of oatmeal that can be customized a million different ways to please everyone in my family–so the person who doesn’t like bananas can have raisins and walnuts instead. And yes, 20ish minutes may seem like a long time when you can boil old fashioned oats on the stove and cook in 5 minutes, but remember you still have to bring the water to a boil and then you have to constantly stir your oats while cooking. In the Instant Pot, making homemade oatmeal with old fashioned oats is COMPLETELY hands off. So I can set everything up for oatmeal in the pressure cooker when I wake up and by the time I have gotten my kids out of bed and dressed, breakfast is ready to be served. I also love making Instant Pot Oatmeal on a Sunday while meal prepping and then letting cool and refrigerating to reheat portions on busy school mornings. 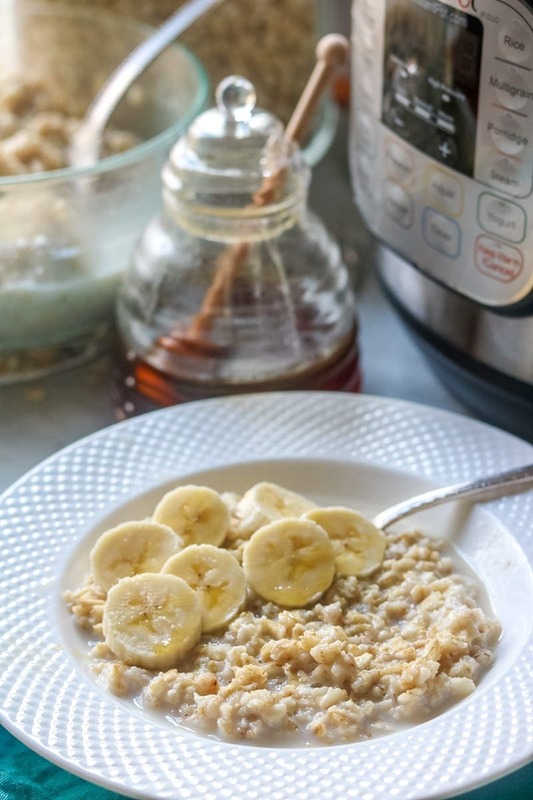 Making old fashioned oats in the Instant Pot is incredibly simple. Step One: Place your trivet in your inner pot of your pressure cooker and pour in 1 cup cold water. Step Two: In a heat safe bowl (I use a 7 cup pyrex glass dish), mix your oats and liquid together with a bit of flax seed. The flax seed is optional but adds omega fatty acids and fiber. I choose to use half water and half dairy of any kind (coconut milk, cows milk, almond milk, etc). You can use all water or all dairy. In my experience all water is incredibly bland and using all dairy/non-dairy as your liquid doesn’t result in oats breaking down into a creamy texture. It is important to note if you are using a high fat dairy (like coconut cream or whole milk) you MUST use only half full fat dairy product with half water so the fat in your dairy will not separate. 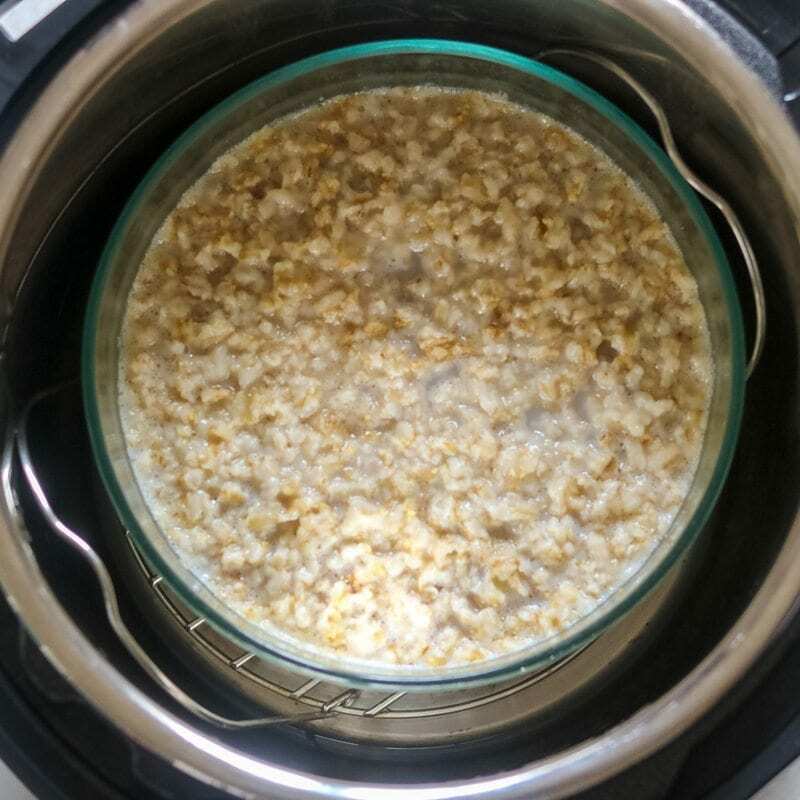 Another important thing to remember when cooking oats in your instant pot, much like rice, you will NOT need as much liquid as you do when cooking on the stove top. This is because, when you cook oats on the stove, liquid is evaporated (even if your pan has a tight fitting lid, but in the pressure cooker, no liquid is evaporated. Step Three: Put the lid on your instant pot, turn your valve to “sealed” and set your pressure cooker to cook on high pressure for 8 minutes. I have found it takes anywhere from 5-10 minutes to come to pressure. 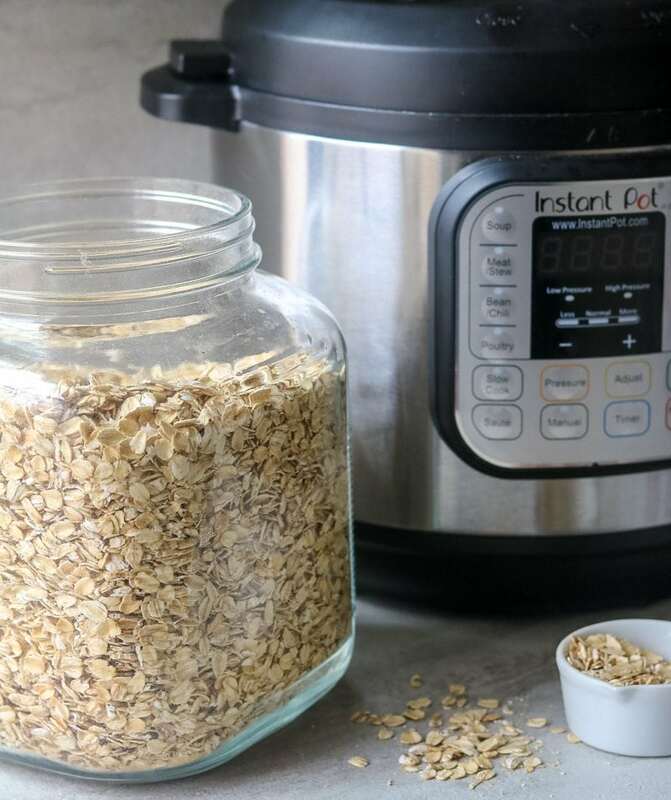 Step Four: Allow your oatmeal to sit in the Instant Pot for at least 5 minutes before doing a quick release of remaining pressure–see my tips on doing a quick release in my Instant Pot 101. I would not release pressure right away, because this may cause your oatmeal to spill out of your pot in pot. Step Five: Serve warm with any desired toppings. There are as about as many varieties of oatmeal as there are people. One of the main reasons I love to make a big batch of plain Instant Pot Oatmeal is so that each person can flavor their oatmeal exactly as they desire. Here are a few of my favorite Instant Pot Oatmeal serving ideas. Each recipe is for one serving of oatmeal. Chocolate Peanut Butter: 1 tablespoon cocoa powder, 1 tablespoons peanut butter, and 1/2 tablespoon maple syrup. Pumpkin Pie: mix in 2-3 tablespoons pumpkin puree, 1/2 tablespoon maple syrup, 1/2 teaspoon each of cinnamon, nutmeg and 1/4 teaspoon ground ginger. Raisin Nut: top oatmeal with a dash of cinnamon and 1-2 tablespoons each of raisins and chopped walnuts. Apple Pie: top oatmeal with chopped fresh apple, cinnamon, and honey or maple syrup. Honey Nut: stir in 1 tablespoon honey and top with toasted nuts of any variety. Pina Colada: top oatmeal with pineapple chunks, toasted coconut and sliced bananas. Serve with a splash of coconut milk. Savory Sausage and Cheese: add in 1/4 cup cooked crumbled sausage and 1/4 cup shredded cheese. In order to make gluten-free oatmeal be sure to use certified gluten-free oats. In order to make these Instant Pot Oats vegan use non-dairy milk. If you want to use quick-cooking or instant oats in place old fashioned oats, adjust cooking time to 5 minutes on high pressure and decrease liquid by 1/2 cup in oatmeal mixture. Do you have to cook this oatmeal using the pot in pot method? No, you don’t have to. I would grease your inner pot with butter or coconut oil and then use only water–no milk or non-dairy milk or you may have the milk burn on the bottom of the inner pot of your pressure cooker. 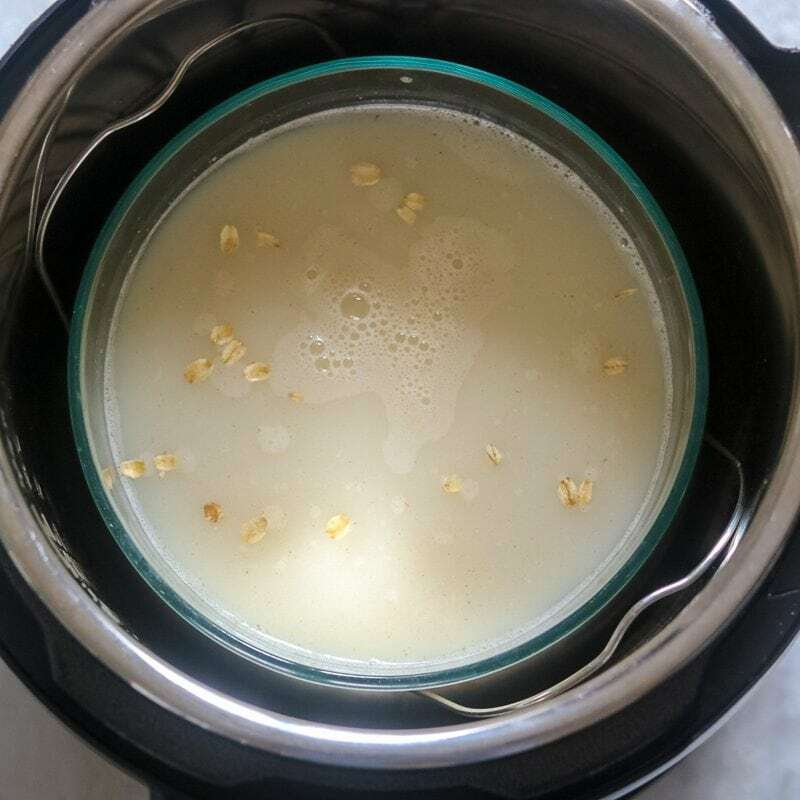 How to cook old fashioned oats in your pressure cooker for creamy, perfectly cooked oatmeal. Insert steamer rack inside inner pot of Instant Pot. Add in 1 cup of water to inner pot. Inside a 7 cup heat safe bowl, mix together the oats, 1 cup water, dairy and flax seed. Place bowl on top of steaming rack and put lid on Instant pot. Set Valve to "sealed" and set manual or time to 8 minutes on high pressure. Allow to naturally release for 5 minutes before carefully releasing any addtional steam by using a wooden spoon to turn valve to vent. Remove bowl carefully from pressure cooker and then serve with desired toppings or allow to cool and store in fridge to reheat as needed. Total Time: 10 minutes to come to pressure + 8 Minutes Cooking Time + 5 Minutes Release= 22 total minutes. (And in case you misplace your Floating Valve, you can get an extra to fit your model on this here. Thanks so much for the recipe! Other recipes I’ve found for oatmeal in the instant pot use all water, and my kids did not go for it. We have oatmeal at least once a week for breakfast–I’m going to try this next time! YAY!!! I totally understand–my kids would not do just plain milk either! Enjoy! Thanks much for the recipe. My first try with oatmeal. Mine has chia seed, apples, & cinnamon in it. Hoping for a good batch cause I’ll make it every week. I love old fashioned oats like my mom used to make! Yum! I hope it turns out perfectly for you Juliana! I LOVE peanut butter and banana together. I would definetely add 1-2 bananas sliced to the oatmeal and up to 1/4 cup peanut butter. As long as you are making this using the pot in pot method, there will be no issues at all adding the banana and peanut butter. If you are making this just in your inner pot–just add the peanut butter and banana on top of the oats and don’t mix in until after it is finished cooking. And yes, 5 minutes for quick oats! Enjoy! I’ve never made instant pot before, but I’m definitely going to try it. Must be delicious! Oatmeal in your instant pot is spectacular. This is amazing.Thank you for sharing recipe! Came out perfect! WAHOO!!! Thanks for sharing your success Jenny! trying your receipe as I type…..really enjoy creamy oatmeal so I cannot image the instant pot doing anythning but at high pressure cook. sadly no bananas at hand at the moment but my 100% Canadian maple syrup is standing by. thanks so much. I hope you enjoy Freddie! The IP makes the most creamy oatmeal in my opinion. And I have to say, I am partial to Canadian Maple Syrup, so I don’t think you will be disappointed. i use 2 cups of water and 2 cups of oatmeal even when not using the extra bowl right? 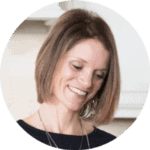 Hi Christa, If you are only using water, you would use 2 cups oatmeal and 4 cups of wate or 3 1/2 cups for thick oatmeal and then NO milk. Hope you enjoy! Kristen, This is a 10 star recipe! I used vanilla flavor almond milk (next time trying coconut milk). I also added 1 Tbsp of chia seeds to your recipe. When done, I stirred in some blueberries & I used stevia for my sweeter. WAHOO!!! I am so happy you shared your success with us all Connie! We love this recipe and grateful that others are finding it a success in their homes as well. Is the 1 cup of water in the bottom of the pot our of the 2 cups in the recipe? so 1 cup in the bottom and 1 cup in the oatmeal with 2 cups of dairy? That is correct Matt! Enjoy! Is the bowl placed inside the pressure cooker in order to make it easier to clean? I am making the oatmeal now. I’ll let you know how it goes. Hi Erica. The pot in pot method is NECESSARY if cooking your oatmeal with dairy. You can not pour dairy directly into your pressure cooker and not get the burn warning. If you are using all water, you will be fine–just a bit messier to clean up. I am glad you ask questions too!! It helps me better write posts in the future 🙂 I hope you love this oatmeal Kathleen! Can steel cut be substituted? And would the water and or almond milk amounts change? Hi Bill, the directions would be different. Here are my directions for Instant Pot Steel Cut Oats. Thank you for posting this recipe! I’m a newbie to IP cooking and this is my first PIP attempt. It turned out great. I used 3 cups of unsweetened vanilla almond milk with my 2 cups oatmeal. So creamy. Going in as a breakfast rotation. YAY!! I am so glad you enjoyed! This Instant Pot can be overwhelming, so I am glad you found my explanations helpful. Yay!!! I am so glad you enjoyed this Judy! And love the tip for the aluminum foil trivets. Hi Annee! I have tried doubling this recipe and cutting in half with fabulous results. But I have not tried with only 1 cup oats. However, I think it will work PERFECTLY. Just be sure to use pot in pot method and pour 1 cup of water under trivet in Instant Pot. I have the 8 quart instant pot. I like to use Pot in Pot so I am trying your recipe now. Should the pip be covered? With something like aluminum foil? How would it turn out if it was or wasn’t covered? Hi Jane, there is no need to cover your pot in pot, unless the recipe states to do so. (In that case you would use foil) But this works perfectly uncovered. Enjoy! Third time I have used my insta pot. I didn’t have a glass bowl that fit in my 6 qrt .instapot. I put ingredients into pot directly and I also used 2 cups if 1% milk for the liquid. Added raisins and cinnamon. Turned out perfect. Pot doesn’t look to hard to clean up. YAY! So glad this was easy for you to follow! HELP! I have tried 3 times and 3 times I have got the BURNT signal. I put 1 cup of old fashioned oats with 3 cups of skimmed milk. Then only 1 min on high pressure and half way it says it is burnt. Why?????? Hi Alicia, I am so sorry for your frustration. You can not put dairy into your instant pot, unless you are using the pot in pot method. Dairy will cause your Instant Pot to get a burn notice. My directions state you need to place your oats and milk in an oven safe bowl. Then pour 1 cup water into the inner pot. Place trivet inside your instant pot and then place your oven safe bowl on trivet and proceed with cooking. If you do not want to use pot in pot you need to use only water to cook your oatmeal. I’ve been looking for a recipe to make oatmeal for the entire week of breakfasts – how do you reheat this recipe? In the microwave? Do you add liquid in before heating? Hi Molly–that is exactly what I do for the week myself. Once it is done cooking in the pressure cooker, I let it cool and then cover and store in fridge. In mornings, I dish out oatmeal into bowls and add a bit extra milk (if needed) and reheat individual servings in microwave. 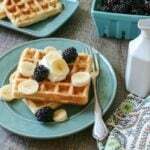 This works best for my family as on school days breakfast is at different times for each of us. Hope that helps! Tried your recipe today in my Instant Pot and it turned out really well! So much easier than standing there by the stove and stirring, stirring, stirring. Thank you for taking the time to work it out and share it. I used all water for the liquid so I can share some oatmeal with my dogs. And I have to tell you about these pots! 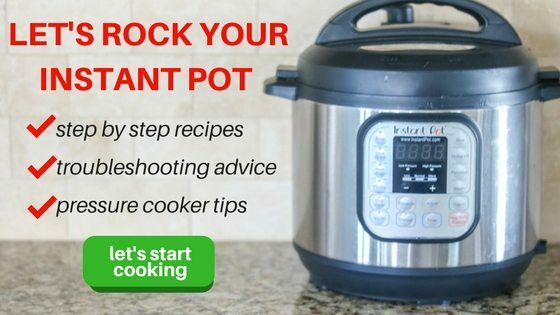 I’ve been looking for pots or bowls to use in my Instant Pot for pot-in-pot cooking. Found a set of bowls that are practically perfect. Stainless steel, the have lids, and they have handles! They come in a set of three. The medium and small bowls fit in the Instant Pot DUO60 6 Qt 7-in-1. I love that you are sharing your oatmeal with you dogs so sweet! And those bowls are great!! Thank you for sharing that as well. This is the best oatmeal. The kind that just sticks to your ribs. Thank you for a great and versatile recipe. 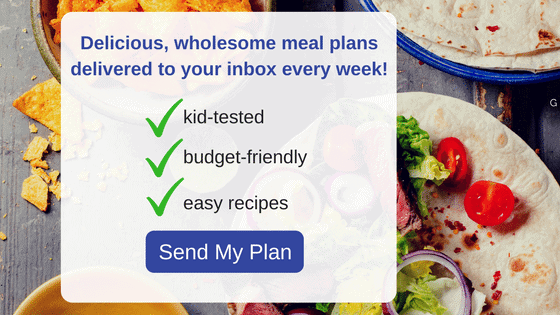 I am so glad you love this recipe Werra! Thank you yummy. I had no idea it was so easy! “new pyrex”(1998 and later when Corning sold it) should not be used in the instant pot as they can shatter, because they’re making them with a different material. (they can also shatter during normal oven use) Stainless steel is the best bet. Thank you for that info! And so glad you enjoyed the oatmeal. I made the oatmeal in the pressure cooker, with 1C water and 2C almond milk. I don’t have a burn warning on my pressure cooker. The time it took to push the button and I turned it off was about 18 minutes. It didn’t burn, but was a little browned on the bottom in one spot. I am so glad it worked out for you! Using dairy may cause a burn notice and that is why I recommend pot in pot for this recipe. Perfect! Pre-made a batch for my toddler. The consistency was much better than the microwave or stove, and very soft. I stirred in some frozen blueberries and cinnamon after cooked. YAY!! I am actually eating some of my IP oatmeal right now–with cinnamon and banana 🙂 I hope your toddler enjoys! Really good. I made this with 1% milk and topped it with just raw brown sugar. Next time I think I will try full fat milk or 1% plus a little half-and-half for a bit more creaminess. I am so glad you enjoyed! Ans yes, full fat milk or half and half will certainly make this creamier! I halved this recipe (1 cup oats, 1/2 cup water, 1 cup milk, 1/2 tbsp milled flaxseed, plus a dash of salt). I still added 1 cup of water to the pot for steaming. After cooking, I added chopped strawberries and xylitol sweetener. It turned out PERFECTLY. So yummy! Thank you! Wahoo!! I am so glad you enjoyed it. I also tried half the recipe, and while it came out great, it must have blown a bubble up and out, because there was oatmeal all over the inside, including the cover. Oh dear…I bet a bubble did form. I make this weekly and have never had that happen. But I am glad it turned out.